It’s week 4 of the 12 Weeks of Christmas and today I am bringing you my all time favorite flavor combination: peanut butter and chocolate. Is there anything better? These are definitely not the typical crisscrossed peanut butter cookies but still have a very distinct peanut butter taste. They are soft, fluffy and pretty much perfect. Noah doesn’t get sweets too often but when we went into the kitchen to get a drink and he spied the cookies on the cooling rack he went crazy. I just couldn’t say no so he enjoyed feeding himself one and making a crumbly mess. Later, he walked into the kitchen but I waited around the corner to see if he was going to come back. He was awfully quiet which usually means he is up to no good so I headed to the kitchen to investigate. And what do I see? He has a cookie in his hand with two bites out of it. Apparently, he is now tall enough to reach things off the countertop. Now I am in real trouble. Can you believe there’s only 2 months until Christmas. I feel the need to start shopping…NOW. I’m a little obsessive. I’m a planner. I’m a list and to-do maker. I like to get things done early so they can be checked off my list. I like to get my shopping done by December 1st if at all possible. I already feel behind and it’s not even Halloween. Crazy much? But instead of stressing, I think I will eat one of these cookies and watch The Real Housewives of Beverly Hills (ssshhhh….I didn’t just admit that). 1. Preheat oven to 350 degrees. Cream peanut butter, shortening and brown sugar until fluffy. Add egg; mix well. Stir in milk and vanilla. 2. Combine flour, baking soda and salt; gradually add to the creamed mixture. Stir in M&M’s. 3. Bake for 7-9 minutes. Let sit on the cookie sheet for about 5 minutes then remove to a cooling rack. Note: Don’t put it too close to the edge of the counter or a little cookie monster may help himself. Your little one is just precious! 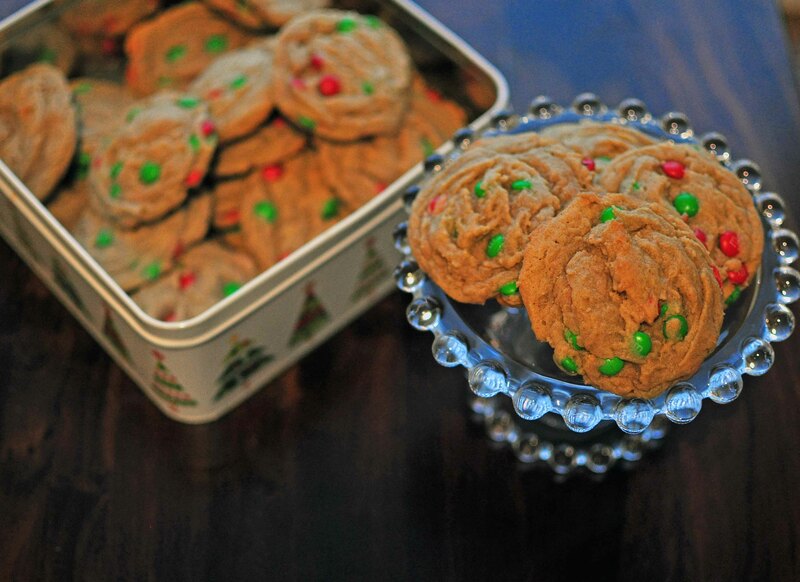 The cookies look so pretty and put me in the mood for Christmas baking. Thank you so much for sharing with Full Plate Thursday. Hope you are having a great week end and come back soon! I love this series! This is our first Christmas in CO, so I need to do a lot of baking since my gfs and our cookie exchange are all back home in TX. I’ll be back for sure! Thanks for linking up to Momtrends Friday Food!